Olga Zinovieva, co-chair of the Rossiya Segodnya Zinoviev Club, on the outcome of 2015 in light of the 2016 priorities. It looks like everyone who wanted to has expressed his opinion of 2015 and his forecasts for 2016 in all possible and impossible tones and virtually simultaneously, as in the numerous ensemble numbers of Rossini's Cinderella. No one remained aloof from emotional passions, and this was expected. Looking back at and assessing one's geopolitical impressions of 2015, one cannot avoid thinking that we (not only in Russia but also in the EU) are being sold an alien, hostile and aggressive scenario of the planet's further development — or rather stagnation amid the senseless sanctions against Russia and the subsequent fiercely Russia-hating acts and strained lies on a global scale. The sanctions against Russia have but little effect on the US economy, and this is why Washington is in no hurry to lift them, preferring instead to keep them in order to fan tensions in Europe. Global politics is like a spider's web, with an immediate reaction to all events and with an alert financial and political spider sitting patiently at its center. The politicians are the ones who decide the future of the planet and human civilization by pulling on one of the many threads in their web. There are many examples, such as the global banking system; supra-national clan ties; the sprawling military machinery; and defiant use of any means for attaining their goals, including prohibited weapons, and the tapping of both friends and enemies. People no longer have any say in big politics. Prime Minister Dmitry Medvedev is true to the principle of remaining optimistic in any, even critical situation. "As for difficulties… Some will remain but there is no doubt that we will eventually overcome them," he said. "Everything will be fine!" Polls show that Russians say the key event in 2015 was Russia's decision to join the fight against the DAISH terrorist group. According to VTsIOM, Russians were mostly concerned about politics in 2015. They said that Turkey's downing of a Russian warplane was the highest profile event of the year, with 74 percent of respondents naming President Vladimir Putin their Man of the Year and Sergey Lavrov as the runner-up. In other words, we see national consolidation in Russia, whereas the EU is suffering from a serious systemic crisis caused by the unwise eastward expansion of the EU and NATO, the decline of the welfare state and the bureaucratization of politics. The educated and civilized European community, which is avoiding Russia's friendly hand, is unable to see that its migration problem also affects Russia, because tens of thousands of refugees who don't look like poor asylum seekers have accumulated on its border. Europe is like a dog that has never been petted or seen any sympathy from humans, always running from a friendly hand and barking like it's mad. Look for this video on the net and you'll see what I mean. I wrote about the role Germany must play in the development of a new Europe in my article My Poor Germany. As I said, the preservation and rebooting of Europe are impossible without the preservation and modernization of Germany. At the same time, the rebooting of Europe is not only vitally needed, but also depends on the rebooting of Germany, which must follow the rebooting of Germany's relations with Russia, and this pave the way for the ultimate rebooting of Europe's relations with Russia. What should be done to revitalize Western Europe as part of united Europe that will also incorporate Russia? I believe that the success of this rebooting depends on the organizations that would be authorized and able to launch the rise of a new Germany and new Russian-German relations that will be free from external dictate. I'd like to say here that one of such organizations was the Russia-Germany Society, and international public organization that was established to promote Russian-German partnership in economics, science, culture, information and other spheres of human endeavor in an atmosphere of growing friendship, mutual understanding and trust between the Russian and German people. The society was established 44 years ago at the initiative of Chancellor Willi Brandt and Soviet leadership and was called the USSR-FRG Society. For many years after its establishment, it worked undeviatingly to achieve its goals. I have been recently invited to join the leadership of this society, and I willingly accepted the offer, considering the importance of Russian-German relations. On December 23, I assumed the office of vice-president of the Russia-Germany Society. I believe that one of the first events to be held by the Society this year should be a Russian-German forum on the possibility of rebooting ties, if not between our two countries, then at least between Russian and German public organizations that are willing to cooperate with each other.. But success, as I see it, depends on the context in which the rebooting will take place. This context is described in the article of Vladimir Lepyokhin, a member of the Rossiya Segodnya Zinoviev Club, titled Two Key Events of the Year: Memory versus Forgetfulness. He writes: "Europe had been the main subject of global history for the past thousand years, but in 2015 the structure of united Europe split into antagonistic parts. Moreover, it is now dominated by a new anthropological type that is fundamentally different from that which developed after the birth of Jesus Christ. I describe it as Homo Oblivious. What we have here is social amnesia." According to Lepyokhin, "the main common European organization, the EU lost its geopolitical sovereignty due to the rejection of its historical essence long before 2015, but last year it became obvious that there are no purely independent European actors in the form of the EU, PACE or any other European organization. All of them have become mere cogs in a larger system called ‘the American world'." Indeed, the EU is puffing out its chest, trying to participate in any and all talks (for example, on the Syrian crisis), but it became perfectly clear last year that almost nothing depends on European leaders and their participation in international affairs is rapidly becoming a sham. In light of this, Russia is interested in rebooting its relations with those European countries that want to preserve their sovereignty, and Germany will play a special role in this process. 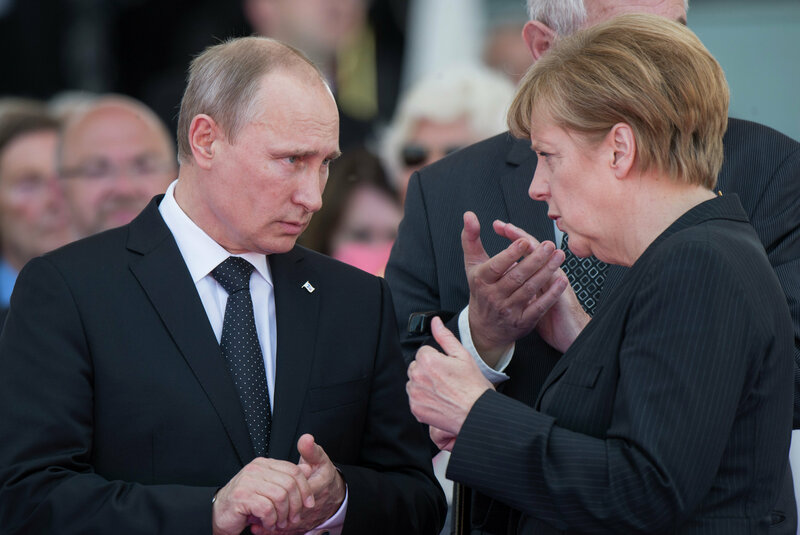 I hope, more accurately, I'm convinced that the year 2016 will see the rebooting of Russian-German relations, which will lead to the revitalization of an independent Europe, one capable of acting in its own interests. The Russian President, in his New Year address to be given five minutes before the end of 2015, has the last word in expressing his expectations for 2016. But now I would like to pass on my New Year best wishes to the more than 146 million Russian citizens who did not have it so easy in 2015 but who protected the honor and dignity of our indivisible and multinational homeland. We've demonstrated our resolve to fight for our country at home and far away from it, both under the bright spotlights of international conferences and at the barbed wire fence of our borders — on land, in the air and space, on and under water.